I love a simple, classic star quilt block. They’re timeless and traditional, but can easily be given a modern, graphic look because of it’s simplicity and by enlarging its size. Today I’m sharing the measurements for a very simple baby quilt from this traditional block that can be made quickly and easily. It’s a great beginner project as well. Yesterday and today at the BERNINA We All Sew site, I’m sharing a simple tutorial for the easy star baby quilt on the right in the LeMoyne, or Lone Star variation. On this site, I’ll be sharing the measurements and construction for another variation of the star quilt on the left. Construction is similar, but fabric requirements and layout are slightly different. If you would prefer a printable PDF version of three of these star baby quilts in one place you can find it here for $3.00. Here’s to two fun variations on the same theme, not to mention a quick way to use pre-cut 10″ squares to make a quick baby gift or wall hanging. 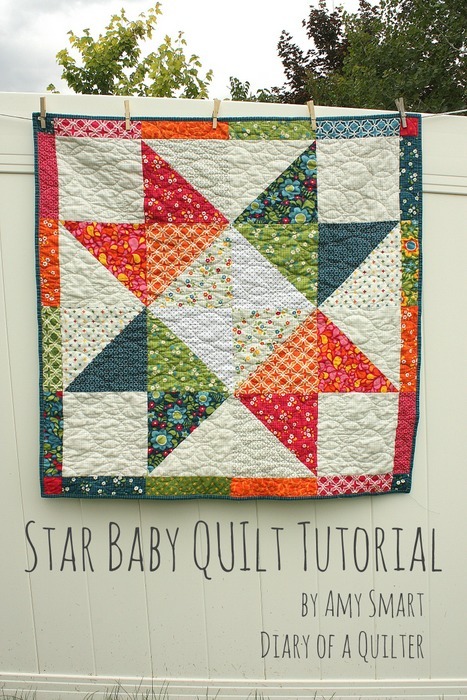 Click here for version 1: the Lone Star Baby Quilt Tutorial. This quilt variation finishes at 40″ x 40″. It is a great project for using pre-cut 10″ squares (or Layer Cake squares), calling for at least 21 10″ x 10″ squares. It could be made very clean and simple or super scrappy – lots of room for variations on a classic quilt block. Draw a diagonal line on the back of the six 10″ x 10″ light squares. Match them up with a colored square and sew a 1/4″ seam down both sides of the drawn line. Repeat with all six pairs. With solid light 9 1/2″ x 9 1/2″ blocks in the four corners, layout 12 half-square blocks in a star motif – 4 blocks across by 4 blocks down. You can use this layout or create one of your own. There are lots of options and variations. Sew blocks into four rows Press seams alternating directions for each row. (For example press all seams to the right on odd rows – 1 &3 and press all seams to the left on even rows 2 & 4.) Then sew four rows together, pressing seams all the same direction. To add borders, sew two sets of four 2 1/2″ x 9 1/2″ strips end to end. Decide which side of the quilt you want to sew them to and press the seams in alternating directions from the seams on that side of the quilt. Sew two borders to opposite sides of the quilt. Press seams toward the borders. For final borders, sew two more sets of four 2 1/2″ x 9 1/2″ strips end to end and sew a 2 1/2″ x 2 1/2″ square to either end. Repeat the process of pressing seams alternating directions from the seams on the quilt side. Pin border at seams and sew final borders to quilt. Press seams toward the borders. If you would prefer non-pieced borders cut four strips 2 1/2″ x the width of fabric and attach them Here is a simple quilt border tutorial. This quilt calls for a 1 1/4 yard piece of fabric (roughly 42″ x 42″). This is the most economical size for backing the quilt, but will be just slightly larger than the quilt front. If you baste carefully, it should still be big enough all the way around with excess backing fabric on all four sides before you quilt it. If not you may want to piece a larger back. I extended my backing fabric by using remnants from my layer cake to make a fun pieced strip through the back of my quilt. There are lots of options for quilting you quilt. Here is a simple quilting tutorial. Big thanks to Sew Shabby Quilting for the quilting on this one. For my binding I cut four strips of fabric 2 1/2″ x the width of the fabric (42″). Sew them together end to end to create one long binding strip. 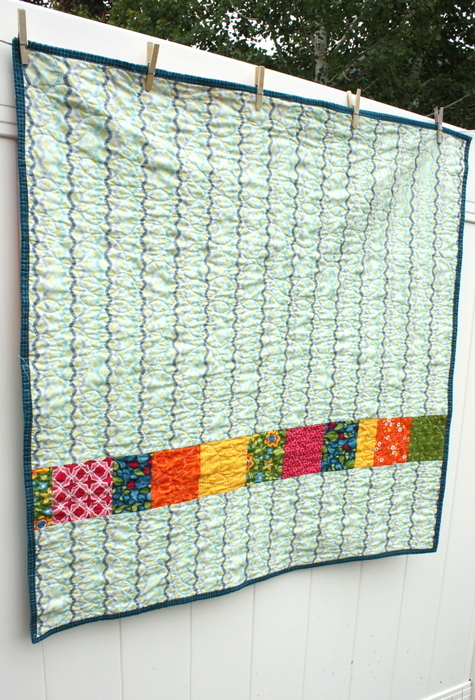 This tutorial shows how to bind – or finish – a quilt. I’ve since added a third variation of this giant star baby quilt. You can find this Safari Party versions here. If you’re looking for a larger variation on this design, check out Jeni Baker’s Giant Vintage Star Tutorial. thank you for this tutorial! i would like to make birthday gifts for some babies, but i am running out of time! so this quick baby quilt is perfect timing! Beautiful colors and great tutorial, thanks for sharing! Cute and easy~ I love it!! I’m just finishing the echo quilting on a giant star (size of Jeni Baker’s) as a wedding gift for a friend of my daughter. She is getting married on Pioneer Day and her theme is western. I made a large blue and red star with light and dark of each. I have no idea how to show you, but trust me, it is awesome. I love, love, love big stars! OH that sounds amazing! What a great gift! These quilts are awesome! Thanks for sharing the tutorial. I’ll certainly be making one for my grandbaby due in January. Excited to try these out. I just made my first quilt that incorporated a star last week and i am in love with it. I’m not great at HST and matching up my points but i find the more I do it, the better I get. Somehow, precuts are helping that issue too. Love these 2 designs. Love your tutorials with the two versions. 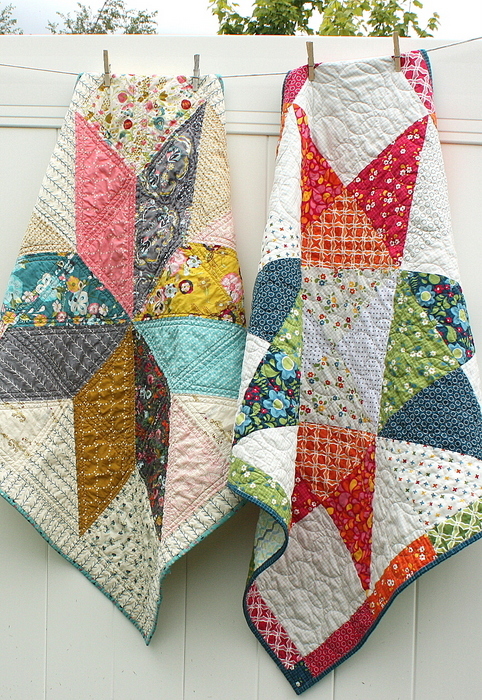 Will have to try these quick beautiful quilt patterns. Thank You Amy! Thank you thank you. Your design and colors are wonderful. Yes! I think you can do it! It’s a great beginner quilt! I love all the collections pictured. Thank you for the baby quilt tutorial! It is perfect for a baby gift. Love it! Made up the top today – thank you SO much for the awesome tutorial! I didn’t have a layer cake, so I cut all the squares from my stash. It took five hours, from selecting fabrics to photography. It looks fabulous!!! Thanks again. I will most likely make another out of some Kaffee Fassett florals I have left over from another project. I have a gorgeous layer cake of reproduction flannels and would love to make this quilt. I know flannels can be difficult when multiple seams are involved at one point. Amy, do you think this would work with flannels? Thanks for your advice. I think this would be a great quilt – and beautiful – with flannels. The blocks are bigger so there aren’t quite as many seams. There might be a little bit of bulk in the center, but that’s it. I say go for it! Thanks for the encouraging words. Will send a pic when done. Our Women’s Club with the local Elk’s Club made a bunch with the Lone Star in 2 colors with the same background, then backed them with flannel, no batting. These were then folded in 3rds and rolled to go into backpacks for officers to keep in their cars for when they have to remove a child from their home. The backpacks have other items also but they wanted a snuggly blanket for comfort. I figured up yardage and made kits up so some of the ladies could take them home to make. That is so awesome! What a great cause. I’m so glad to hear! I’m in charge of a small group of quilters here on the Central California Coast. I decided to use your tutorial for an online QAL, giving the group until the end of September to complete their quilts. Everyone got so excited, most of them already have their tops done! I’m still trying to choose fabrics! LOL! We’re on Facebook as the Central Coast Modern Quilting Friendship Group, if you want to check out the quilts. Thanks for such a great tutorial! Hi there, what do you mean about pressing seams in one direction or another? Buying fabric tomorrow !! So excited! Basically it means that you’re pressing your seam allowances over to one side (rather than pressing them open). Most patterns will tell you which direction to press your seams (right or left, toward the dark, etc). This will play a role later when you assemble the blocks so that you avoid as many overlapping seams as possible. Also! If I were buying this in metres how many metres would I need of both light and dark fabric? Thx! Is this baby quilt a crib quilt size? THey are 40″ x 40″. So probably more of a baby size. 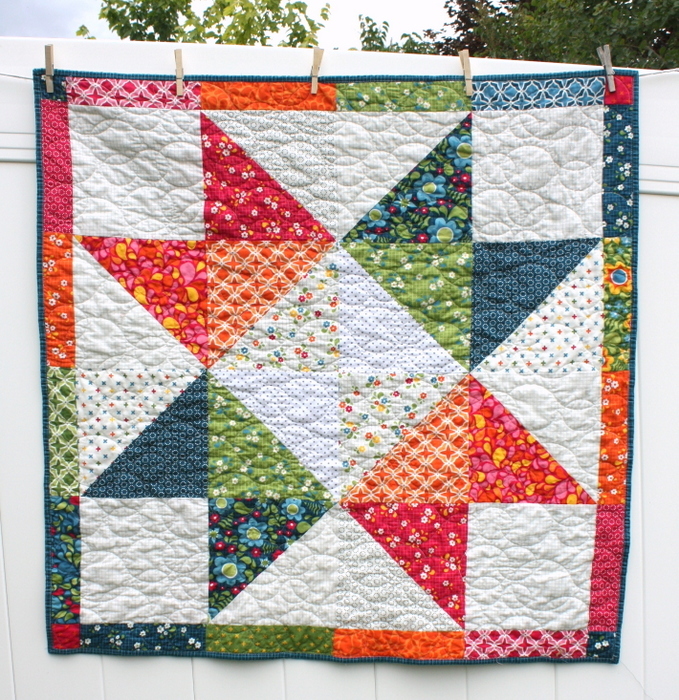 Just a note to let you know that I have featured this beautiful Star Baby quilt on the By Your Hands blog today. Would love to have you stop by http://www.byyourhands.com! Love this, but I have no baby. Would you just double everything in size to make it an adult size?